Last weekend, I found myself dreamily standing in the midst of a sea of blue camass flowers at the Camassia Natural Area in West Linn. The camass flowering season peaks in May, giving hikers a similar sense of watery wonder. 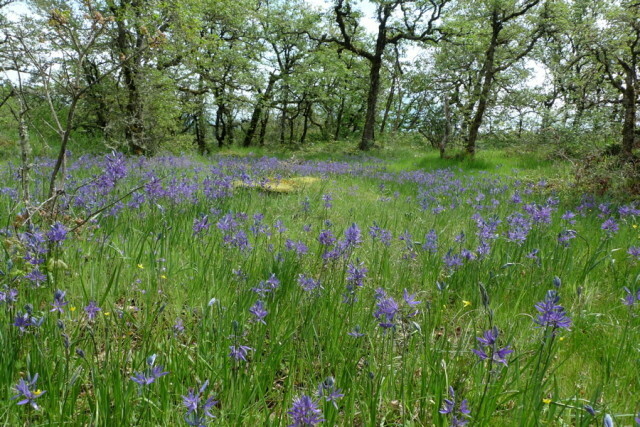 This Nature Conservancy preserve is named after the common camas (Camassia quamash), a beautiful native wildflower which blooms prodigiously in April and into early May and even beyond. Nestled above the Clackamas and Willamette rivers practically opposite downtown Oregon City, the rocky plateau on which Camassia sits was scraped clean between 12,000 and 19,000 years ago during the Bretz Floods, which deposited glacial erratics – granitic boulders from as far away as Canada – along its path. This 26-acre protected plot of land in West Linn is mostly dry oak-madrone woodland, with some 300 plant species. Low-lying areas include both ponds and seasonal wet meadows – perfect habitat for camas and many other lovely wildflowers. If you should be inspired to plant camas lilies in your own garden, you can find two species of Willamette Valley native camas (common camas, C. quamash and great camas, C. leichtlinii) in pots around now, and sometimes into early July, in the native plant section of your local nursery – and occasionally in the perennials section. But in fall, you can buy dry bulbs, which are cheaper. The drawback? For some reason, it’s harder (though not impossible) to find our native species in bulb form in autumn. But the garden cultivars, including lovely white forms, are beautiful, too.